The San Francisco Chronicle has an interesting article looking at the OQO and how this handheld computer is faring against ultraportables like the Eee PC. When the OQO first hit the market, there wasn’t really anything like it. 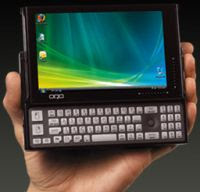 The computer is barely bigger than a PDA, but it packs a full version of Windows XP or Vista, has a slide-out keyboard, 40GB or larger hard drive, and a 5 inch 800 x 480 pixel display. After a series of price drops, the OQO also still has a starting price of $1300, while the new kids on the block like the Eee PC, Everex Cloudbook, and HP Mini-Note start at just $250 to $500. While the OQO represents an engineering feat, the Eee PC basically consists of a bunch of standard computer components packed into a small case. And as the low-cost ultraportable revolution led by Asus continues, the question of whether the OQO can survive seems pretty valid. Apparently OQO is making more than $20 million in sales. But in order to stay afloat, OQO needs to develop a dedicated audience for its device. The company plans to target mobile professionals who value portability and performance. But honestly, the OQO has the same processor as the HP Mini-Note, but a smaller keyboard and twice the price tag. I just don’t see much value other than the fact that you can put the OQO in your pocket, while the Mini-Note will need to go in your bag. But seriously, are you going to put a $1300 computer in your pocket anyway?